On December 1, 2017, the Florida Bar Appellate Practice Section hosted a full-day seminar at the Chester H. Ferguson Law Center in Tampa, Florida. The seminar covered the juicy, inside details we all wanted to know about practicing before the Second District Court of Appeal. Where the inner workings of many courts are a pure mystery to most practitioners (myself included), the Second District is a self-professed “user-friendly” court—a sentiment that was echoed several times throughout the program. The morning kicked off with an update on the state of the Second District, delivered by Chief Judge Edward LaRose. 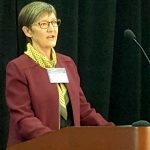 At the end of his update, Chief Judge LaRose emphasized that the Second District strived to be as user-friendly as possible for its litigants, whom he referred to as the court’s “customers.” Next up was the Second District’s Marshal, Jacinda (Jo) Haynes, who discussed her dual role at the court. Not only is Ms. Haynes charged with the security of the court, she also serves in an administrative capacity. Essentially, Ms. Haynes keeps the Court functioning. Mid-morning, the attendees got a sneak-peek into what goes on in a judge’s chambers at the Second District. Judge Darryl Casanueva; his two staff attorneys, Bonnie Eshleman and Stacy Strohauer Son; and his judicial assistant, Louise Norstrom, participated in a moderated discussion of the evolution of a case at the Second District. This discussion was followed by a rapid-fire, “yes” or “no” question and answer session, which was impressively attended by most of the Second District judges. The “yes” or “no” question format was fun, but—as when you pose a question to any lawyer, judges inclusive—there were many “it depends” answers, which made for interesting follow-up discussions. 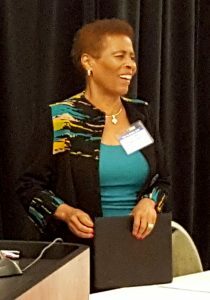 While the morning sessions were all informative and entertaining, nothing could top the keynote address given by Justice Peggy Quince during lunch. Justice Quince was an interesting and relatable speaker, who discussed the path she took to reach her current position and the influence her father played in her life. At the end of her speech, Justice Quince discussed the importance of pro bono work and encouraged those present to give back and participate in our communities. The afternoon sessions commenced with a presentation from the Second District Clerk, Mary Elizabeth (Mary Beth) Kuenzel. Mrs. Kuenzel explained the role of the clerk’s office, and like Judge LaRose, she emphasized that the Second District strives to be user friendly. At the end of her presentation, she encouraged and welcomed any feedback from those present on how the Court could further improve its services. 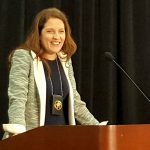 The next session, presented by Bridget Remington of Himes & Hearn, P.A., addressed the best practices for family law appeals. Ms. Remington, who is an experienced family law attorney, provided some great tips for dealing with clients, delivered with some much-appreciated humor. The last presentation of the day, given by Henry Gerome Gyden of Gyden Law Group, discussed the ever-changing state of technology in the law. Mr. Gyden provided examples of tools available to appellate practitioners, particularly applicable to preparing for and delivering oral arguments. But the day of fun did not end here. The seminar was followed by a judicial reception at local riverside hotspot, Ulele Restaurant and Brewery, which was well-attended by judges and practitioners alike. Overall, the seminar was entertaining, engaging, and, most importantly, educational. 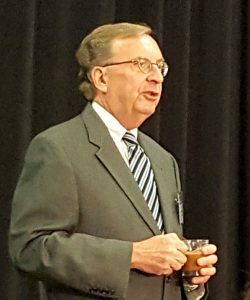 It gave the attendees a unique opportunity to peek behind the curtain and see the inner workings of an appellate court. The Section would like to thank its sponsors for making this seminar possible and Event Chairs Jared Krukar and Duane Daiker for organizing and executing this event. 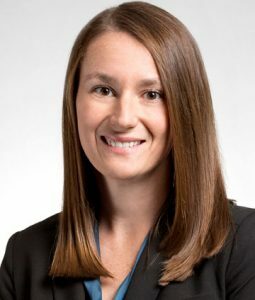 Diana N. Evans is an Associate in the Tampa, Florida office of Bradley where she maintains a diverse litigation practice, including the representation of product manufacturers throughout the country. Diana joined the Firm after clerking for the Honorable James S. Moody, Jr. of the District Court for the Middle District of Florida. Diana can be reached at dnevans@bradley.com.